July 17, 2013 Daniel G.
If you have recently listed your house for sale, then there is a good chance you are looking into tips for home staging in order to increase your chances of success when it comes to selling the home. If you’re not, then you should be! After all, there are all kinds of steps you can take to increase the overall appeal of your home to potential home buyers and those who schedule showings. One aspect that many people fail to consider when it comes to home staging, however, is the importance of preparing your home’s floors. For starters, if you do not already have any hardwood flooring in your home, now would be a great time to have some installed. After all, this is generally thought of as the most appealing type of flooring in homes, especially in areas such as main living spaces and kitchens. You can have this type of flooring purchased and installed for less than you would expect if you shop around and choose the right company, too. To begin with, you should start by using a microfiber dusting pad to get rid of excess debris from the wooden floors. This is an important first step to prepare the floors for further cleaning and polishing. Be sure to buy a microfiber cleaning pad, as other types may not be soft enough and could end up scratching your wooden floors. To get debris and dust out of crevices and corners, you may also want to consider using a hose attachment on your vacuum. Next, choose a floor cleaner that is specifically made for hardwood flooring. 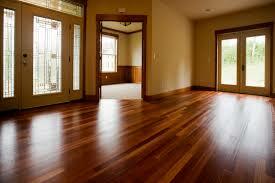 Never use a generic disinfectant or other cleaner that is not labeled specifically for use on hardwood. This is because it could cause serious and expensive damage to the flooring this way. Apply small amounts of the cleaner to each area of the floor and rub them into the wood using a microfiber pad. 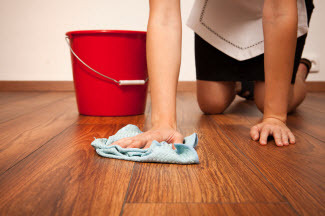 Once the cleaner is applied, check to make sure that the floors are not too slippery. If the floors are slippery, ensure that any potential buyers you show your home to keep their shoes on when viewing the home to avoid slipping hazards. Once the floors are shiny and clean, you may also want to consider applying a floor polish to give them an extra shine and protective finish. Most of these come in a wax form, though some cleaners even have the polish built in to save you time and hassle. Overall, preparing your hardwood floor for a home showing takes time and careful work. However, in taking the time to get your floors looking their best, you will drastically increase the overall appearance of your interior space and your chances of being able to sell your home.